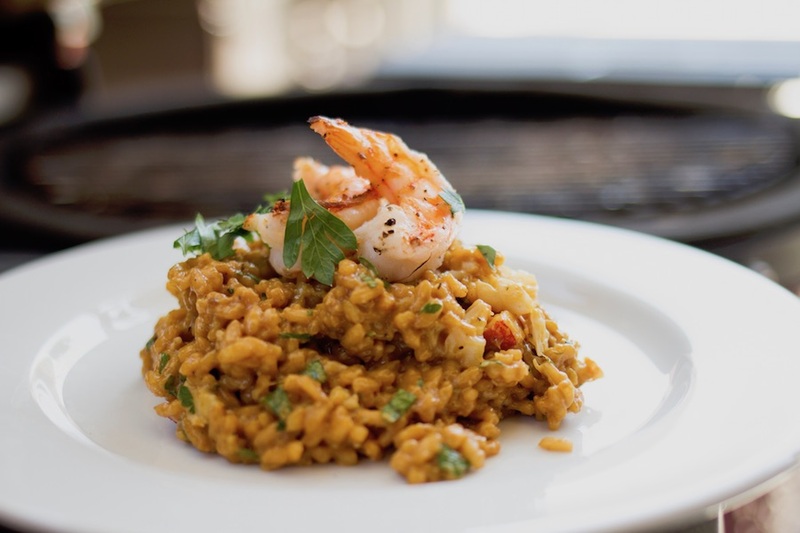 Pitmaster Josh Cary and Chef Tom Jackson continue a new series of recipes based on films, this time with a risotto inspired by the opening scene of the 1996 film “Big Night.” Chef Tom then cooks up a delicious Seafood Risotto with grilled shrimp and lobster cooked directly over the coals of our Kamado Joe Classic II. Combine the vegetable stock and clam juice in a small pot and warm on the stove top. Heat a 12” cast iron skillet over medium low heat. Add the butter. When the butter is melted, add the shallots. Cook, stirring occasionally until translucent, about 1-2 minutes. Add the garlic. Cook for about one minute. Add the arborio rice. Cook, stirring constantly for about one minute. Add the white wine and cook until the rice has absorbed all of the liquid, about 3-5 minutes, stirring constantly. Add 1/2 cup of the stock/clam juice mixture to the skillet of rice. Stir constantly until all liquid is absorbed. Then, add another 1/2 cup of the liquid and repeat the process. Do this until the rice is tender and cooked through. Place a lid on the skillet. Prepare your grill for direct, high heat grilling. Split the lobster tail down the middle, cutting from the bottom side, down to the shell, but not through the shell. Pop the tail open so the cut flesh is exposed. Loosen the flesh from the shell, but leave attached at the tail end. Slide the shrimp onto skewers. Rub a small amount of oil on the flesh of the lobster tail and shrimp. Season with salt and pepper. Grill the lobster, flesh side down, until lightly charred, then flip so the shell side is down. Cook until all of the flesh is opaque. Grill the shrimp on both sides until lightly charred and opaque. Squeeze a small amount of lemon juice over the seafood. Reserve half of the shrimp. Dice the rest, as well as the lobster. Stir the seafood, parmesan cheese and parsley into the risotto. Taste and season with salt and pepper. Serve immediately, topped with a whole shrimp, for garnish.